Add additional keepsakes to your Sweetie bracelet with this sterling silver split ring. This split ring is easy to add on yourself to carry that extra special memory with you wherever you go. Links of London, capturing the spirit of the capital within a beautifully eclectic collection of jewellery. 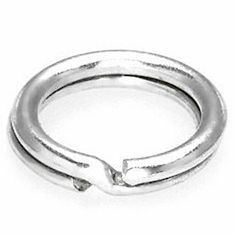 Links of London Sterling Silver Sweetie 7mm Split Ring is rated 5.0 out of 5 by 1.